Our mission, should we choose to accept, was to take something we had "pinned" and actually make it! Apparently a lot of us "pin" all sorts of cool ideas but never get around to making them... GUILTY! I already love Sherry's blog (Young House Love) and Emily's blog (Emily Henderson), but now I am officially fans of Katie's blog (Bower Power) and Lana's blog (Making a House a Home). You may recognize Emily if you are an HGTV fan like me– she won last season's Design Star and has her own show, Secrets of a Stylist. 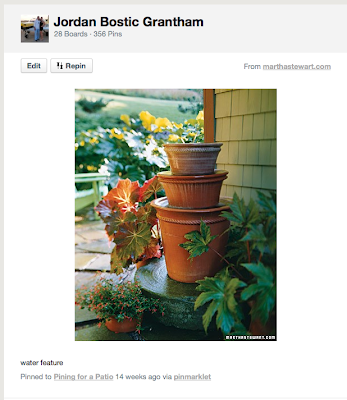 It's a DIY water feature from Martha Stewart's website that was made out of flower pots. We bought the pots a while ago (I wrote about my awesome bargain score HERE), so we just hadn't gotten around to this project yet. This amazing thing happens when I leave town, even if it's only for a day like this past weekend. My husband goes into work mode and completes house projects at warp speed! Apparently I'm a distraction? Anyway, while I was gone this past Friday, he managed to weather-seal the fence, paint the front door and build me a fountain. It was really very sweet, and he built this fountain for me as an anniversary gift. (He didn't reference my Pinterest photo of the Martha Stewart version, although I have shown him that picture many, many times and I'm sure he had that in his head when he made this one.) It was such a nice surprise when I came home! Scott bought a simple 300 GPH (gallons per hour) pump at Lowes. He drilled a hole using a wood chisel drill bit into the bigger pot that he used as the base so he could run the pump cord through the hole. Inside the big pot, the second tier is sitting on an upside-down pot. It's a cheap plastic pot, but it does the job and gives us the height we were looking for. There is a hole drilled through the cheap pot, too, so the pump can reach all the way up to the top. There are a few holes in the side of the plastic pot so the water would drain well. The top pot needs a hole in the bottom, too. That means each pot needs a hole so that the wire for the pump can run all the way up the middle of the fountain. We used extra bricks we had laying around (from digging up an old brick pathway where our patio is now), to fill up the bottom of the pot. Then we used the holes in the bricks to brace our fountain pump so that it would point straight up and be centered in the top pump. Once the bricks were taking up the majority of the space, we filled in the rest of the pots with leftover rock from our landscaping project (read about that HERE). Scott used the hose to fill the pots with water so there would be enough to circulate, and then he turned on the pump. It was perfect! I knew it would be nice to have a fountain out there, but I had no idea how luxurious it would feel to have the sound of running water on our patio. Suddenly I feel very transported to a wonderful resort or something! You can even hear the fountain inside our master bedroom, which is extra nice when taking a mid-day siesta to escape our extemely high temperatures. It's 110 degrees today, by the way! I'm so proud of my husband for unknowingly tackling the Pinterest Challenge and checking one of the items off our to-do list. He's pretty cool sometimes. Side Note #1: I made another flower pot fountain with a slightly different design. Check it out! Side Note #2: Did you know I went to college in New Mexico (Go Aggies!) and have a special fondness for Southwestern goodies, including textiles? One of my new favorite sources is Southwestern Rug Depot.